A sea lion pup with head-mounted time-depth recorder is recaptured in April 2008 at Glacier Island, Prince William Sound. The goal of this project is to examine the combined roles that physiological development, nutritional source and demand for independent foraging play in the ontogeny (development) of behavior by sea lions over their first winter. To accomplish this, we captured sea lions at 5 months of age (November) and recaptured the same individuals at 10 months (March/April) during two field seasons (2005-6 and 2007-8). We selected northern Prince William Sound for this project because our previous work suggested most sea lions marked in November would loiter in this region until April. We glued a small time and depth recording instrument (TDR) to the fur of each sea lion. The TDRs collected depth, wet (submerged) or dry (haulout / on surface) status, light level and temperature every 5 seconds for later retrieval. From each sea lion we collected samples to determine the percent of body fat (deuterium dilution), to determine relative changes in nutritional source (stable isotope analysis of vibrissae, fatty acids analysis of blubber), and collected health, gastric, genetics and toxicology samples. 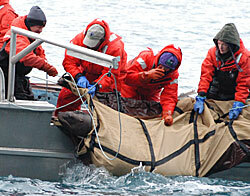 Each sea lion was also permanently marked for later identification and ongoing population studies. All procedures were conducted under gas anesthesia administered by a veterinary anesthesiologist. During their first winter, sea lion pups had a mid-winter peak in many dive behavior measures, such as the proportion of time they spent submerged while at-sea. For many of these measures, we also observed that pups were more active at night than during daylight. Of 71 pups initially captured, we recaptured 30 in April, and 20 of these pups had usable data from their TDRs. On recapture, we repeated most of the sampling done in November in order to produce the first set of repeated measurements from individual free-ranging Steller sea lions. Genetics samples and permanent marking were not repeated. TDRs were removed and downloaded for analysis. This project was the first attempt to capture and later recapture individual Steller sea lions, and we gained valuable practical experience. During March/April we re-sighted 87% of sea lions initially captured in November, and we managed to recapture 44 % (30 of 71) of sea lions. While each initial November capture required a mean of 11 minutes diving, targeted recaptures of marked sea lions required a mean of 117 minutes. Whether such success can be replicated in other regions or seasons will depend on the tendency of sea lions to remain within a predictable set of haulouts for the study duration. Laboratory and statistical analysis of data collected by this project is currently underway. The amount of travel up and down the water column by sea lion pups over their first winter was weakly correlated with their gain in mass and lipid mass.